Antony Gormley. Blind Light, 2007. Image via BBC Online. When Allan Kaprow wrote these words in 1961, he was describing the tendency among the postwar avant-garde to physically and intellectually invite the audience into the art itself. Though he was speaking specifically in the context of Happenings, his quote could easily describe the nature of art produced by many of the earth artists, minimalists, installation, and performance artists of later decades. Furthermore, it can aptly reference the output of contemporary artists of today—those creative minds who defy any particular label but have enjoyed remarkable success at recent exhibitions in America and abroad. Debates of nomenclature aside, the art considered here is that which allows for (or necessitates) the visitor’s physical action, manipulates his/her sensory encounters, and/or showcases his/her creative expression. In such art, it is often the experience of the audience that becomes the true object or subject of the work. Of course, art that reaches completion only through audience participation has been around for years, ranging from those conceptual pieces that feature relatively passive involvement (think treading upon Carl Andre’s sculptures), to mild interaction (taking and consuming Félix González-Torres’s cellophane-wrapped candies), to a more dynamic, total immersion of the public into the art (in 1964’s Cut Piece audience members cut off Yoko Ono’s garments until they left her completely naked). 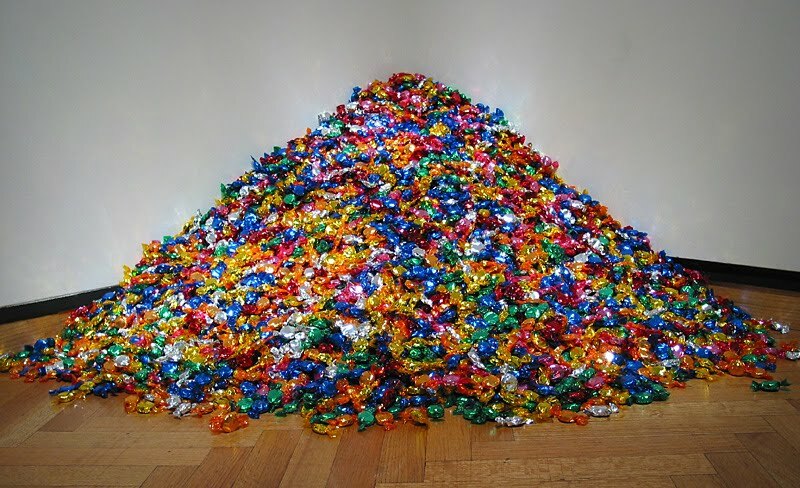 Felix Gonzalez-Torres. Untitled (Portrait of Ross in L.A.), 1991. © The Felix Gonzalez-Torres Foundation. And what of more recent manifestations of this trend? Olafur Eliasson’s various projects have ranged from creating a venue for visitors to play with the effect of their own shadows (The Weather Project, 2003) to constructing a man-made island on which students gather to socialize and debate (The Parliament of Reality, 2009). For This Progress, Tino Sehgal lured visitors to the Guggenheim to exercise their intellectual muscles through philosophical dialogue with trained guides. If exploring your emotions is more your cup of tea, then you may have lost yourself—quite literally—in the disorienting light and darkness, respectively, of Antony Gormley’s Blind Light (2007) and Miroslaw Balka’s How It Is (2009). In his controversial One & Other work last year on Trafalgar Square’s Fourth Plinth, Gormley left the burden of the performance entirely in the hands of the audience members, each of whom applied to win the spotlight for an hour. Currently on view at the Metropolitan Museum of Art, Doug and Mike Starn’s Big Bambú presents a more corporeal experience, offering visitors the chance to walk through a maze of pathways erected on the rooftop. All of these examples earned, or are earning, significant attention and considerable traffic, and only serve as the tip of the participatory art iceberg. The rise and success of such art is not surprising. Ours is a culture that has grown to expect instant gratification and an all-access pass; we are constantly “plugged in” and busy narrating our lives by posting feedback and opinions online. We are wholly accustomed to interactivity, and art that reflects such reciprocation and proactive involvement resonates deeply with us. By turning art viewing into an inclusive experience, the artist strengthens our understanding of the piece, and perhaps inspires the visitor to spend a bit longer on each painting or sculpture. For those works that act as conduits to our emotions, artists have provided an outlet for every sentiment—from relishing in our memories of and love for our mothers (Ono’s My Mommy Is Beautiful, 2004) to releasing pent-up aggression and frustrations (Marina Abramovic’s dangerous Rhythm 0 of 1974, or David Belt’s Glassphemy! of 2010). One only needs to look to Abramovic’s just-closed retrospective at MoMA, The Artist Is Present, to witness the poignant reactions of visitors who elect to sit across from the artist in the museum’s atrium. Visitor to Marina Abramovic: The Artist is Present, 2010. Museum of Modern Art, New York. Image via Flickr. Photo: Marco Anelli. Today’s art museums are wising up to the benefits of interactivity. Many institutions have adapted to the needs of increasingly web-oriented, digitally-minded visitors who expect instant access and involvement both inside and outside museum walls. Such institutions have begun utilizing iPhone apps and social networking to promote events, online galleries to inform those at home, and touch-screen technology to guide perceptions within exhibitions. The savvier museums are also mastering how to define and regulate issues of conserving, displaying, and owning conceptual works that conflate art and audience. Given that art administration and market dynamics have progressed to keep pace with the art, perhaps participatory pieces are no longer as “fragile” as Kaprow expressed. Works featuring interactivity—those that refuse classification and simple explanation—are finally shrugging off their adolescence and hitting their stride. Some critics argue that communal experience devolves the message of such artworks into universal banality; others contend that the original artist becomes eclipsed, and rendered moot, by the creative expression of the audience. This view seems to be missing the point: that it is the genius of the concept behind the art that is the true product, not whatever aspect of the visitor’s body or mind is being used to tell the story. The explicit parallels between participatory art and entertainment also do nothing to detract from quality, in my view. After all, “popular” doesn’t necessarily translate to “uninspiring” or “trivial,” nor does the idea of community experience. Keep in mind that films are watched and shared by millions, though no one would argue that movies cannot be thought-provoking masterpieces. This is not to say, however, that traditional painting and sculpture will not always be created and beloved—they definitely will be. The public will forever harbor great respect for technical skill and for a palpable object representing an artist’s singular vision. Just look to last year’s augural ArtPrize competition, in which voters (not a jury) crowned Ran Ortner’s massive photorealistic oil painting, Open Water No. 24, as the winner. Ran Ortner. Open Water No. 24, 2009. Image via Grand Rapids Press. Photo: Lori Niedenfuer Cool. In general, however, as galleries and nonprofit institutions hone their skills in dealing with hard-to-define conceptual works, artists will focus their creativity on pushing the envelope even further. The era of hiding new and inventive artistic efforts among underground, rebellious movements, is over; it pays now to be participatory. Art is no longer a spectator sport, and the game’s only just begun. Meg Floryan is a graduate of Sotheby’s Institute of Art with a Masters in American Fine & Decorative Art. Thank you Meg for bringing up a lot of good issues in your thoughtful post. I recently attended the Open Engagement conference put on by Portland State University’s Social Practice MFA program. The work produced in this art department generally squares with the type of work you’ve already mentioned. One question that came up for me during the conference is this tricky relationship between the “fragile but marvelous life” of much of this work and the administrative and market dynamics that adjust to it. What interests me are the ways in which this relationship might become a truly dynamic one, something that involves a generative process between an artist and an institution. Perhaps even a kind of institution that may not exist yet. Similar issues seem to have come up in the late 60’s/early 70’s with the eventual market absorption of conceptual art. Critics like Lucy Lippard lauded conceptual art because the fact that the art existed as an idea and not strictly as material created hope that the work might escape the market altogether. Of course, markets dynamically adjusted, and it wasn’t long before Lippard and others admitted that the work did not succeed on precisely these terms that, early on, they had expected it to. Lately, a spotlight of academic interest has been shone onto independent systems of support that existed alongside the conceptual work being made in the US at the time. In New York alone, there was both the Art Workers Coalition and FOOD (a restaurant in SoHo run by Carol Gooden and Gordon Matta-Clark that employed artists on flexible schedules). As we think about present changes in art practice, it seems to me to be equally important to consider changes in administrative practices that might support new work (and how artists and institutions have taken this on in the past). Practices that produce a more equitable, diverse, and interesting art world that we can feel good about participating in. I would like to inform you about a Participatory Design Conference, taking place in Namibia in 2014. I believe that this conference may be of interest to you. piece. Alternatively, art in which the participants shape the design and create the art work are also accepted. The art installations will be displayed as an exhibition during the conference. Please E-mail me if you have any further questions. Pingback: Interactive and Participatory Art | Wynter K.